As everyone knows, complete Carboniferous trilobites are quite rare, and multiple plates are almost unheard-of. This is an outstanding multiple specimen of Ameropiltonia lauradanae from the Mississippian of Missouri. 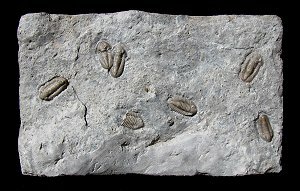 This specimen has EIGHT trilobites preserved, of which SEVEN are complete! The fossil is totally natural - the trilobites have not been moved or composited. This type of trilobite has fine granules completely covering the exoskeleton, which are quite evident on all of the bugs. The brownish color of the trilobites contrasts beautifully with the grey matrix. The fossils are beautifully showcased on the rectangular plate of limestone. As far as we know, this is EASILY the most prolific and collectible plate of Ameropiltonia lauradanae ever found, period.